Looking for Russian PDF lessons? Here you will find a growing collection of free lessons on vocabulary words, grammar and more. Just click on the links to download the PDFs for free or right click & save as to save to your computer. Want FREE Russian Audio Lessons? Click here. Want a complete Russian language learning program? Click here. How to Learn Russian: A Guide for Beginners ONLY. This is a BEGINNER’S guide to learning Russian. More so, advice, best practices, how NOT to fail and everything you will understand WHEN you’re fluent… and wish you knew earlier. Best if reviewed as much as possible. These rules need to be drilled into your head. Russian PDF Lesson Cheat Sheets. 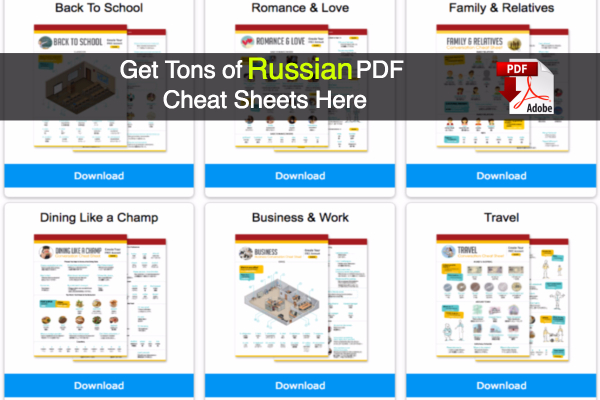 This is a great collection of Russian PDF Lessons and cheat sheets. About 1 to 2 pages long. They cover various topics such as romance, talking to family, business Russian and much more. 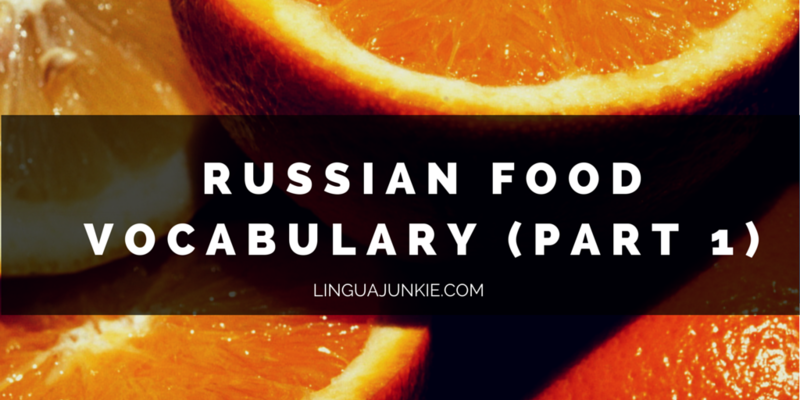 Russian Food Vocabulary (Part 1). This PDF covers the basics: drinks, fruits, vegetables, meats, grains and such. Total of 99 words. If you want to check out the entire list without the PDF, click here. Top 15 Russian Questions for Conversations. This PDF covers the most common questions you know in English… and should know in Russian. Great for Beginners. 50 Russian Adjectives (Personality Edition). This PDF covers the 50 adjectives you’d use to describe someone’s personality with. Happy. Sad. Charismatic. Cool. Check it out! Top 50 Russian Verbs for Beginners. These are the 50 must know Russian verbs. Download this Russian Verbs List and be sure to print it out. Inside: Cyrillic, Pronunciation and the meanings. 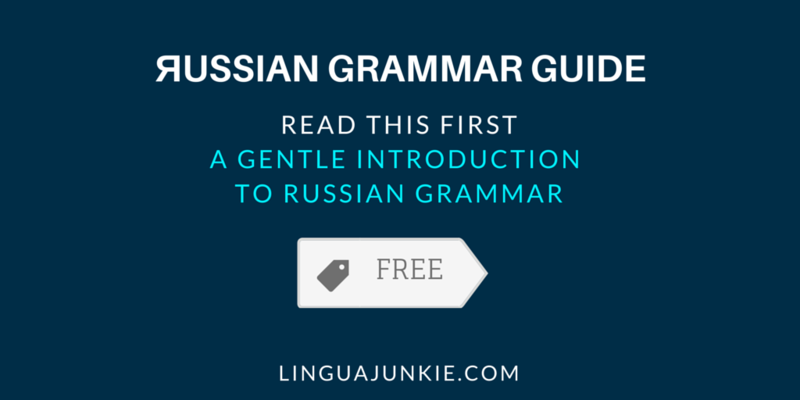 A Gentle Introduction to Russian Grammar PDF. Want to learn Russian grammar? Are you a beginner? This quick lesson will tell you what you need to know about grammar and how to succeed with it. 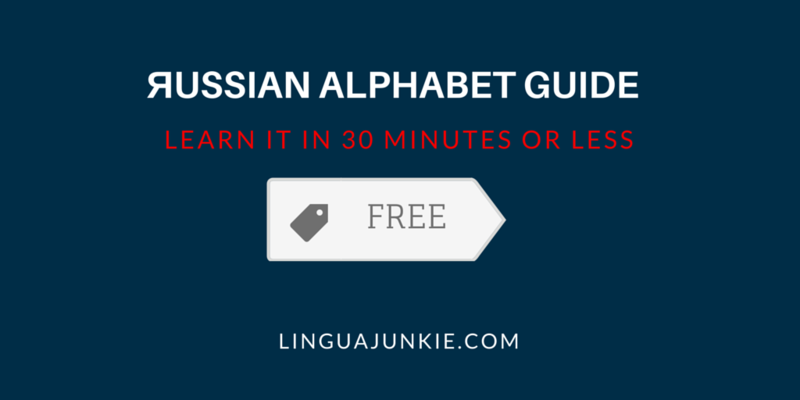 Russian Alphabet PDF Lesson. How many letters are there in the Russian alphabet? And how can you write and pronounce them? Good question. You’ll learn it all in 30 minutes or less here. Russian Numbers 1-100 PDF Lesson. 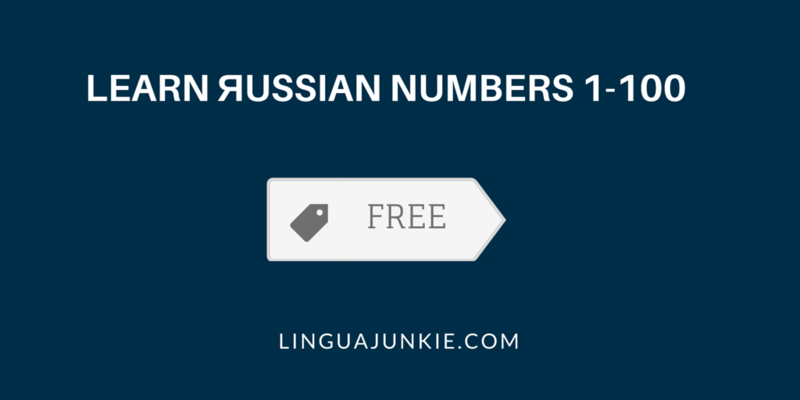 Learn how to count in Russian in 10 minutes or less. This guide covers the numbers from 1 to 100. Russian Grammar Lesson 1. This PDF covers 4 things. 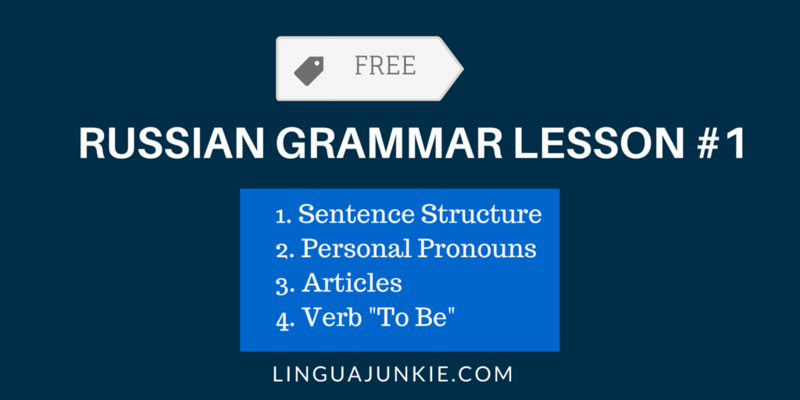 How to form sentences, personal pronouns, articles and the verb to be. More Russian PDF lessons coming soon! Download and share these! P.S. I highly recommend this for Russian learners. If you REALLY want to learn to Russian with fast, easy lessons by real teachers – Sign up for free at RussianPod101 (click here) and start learning! Great online learning program.